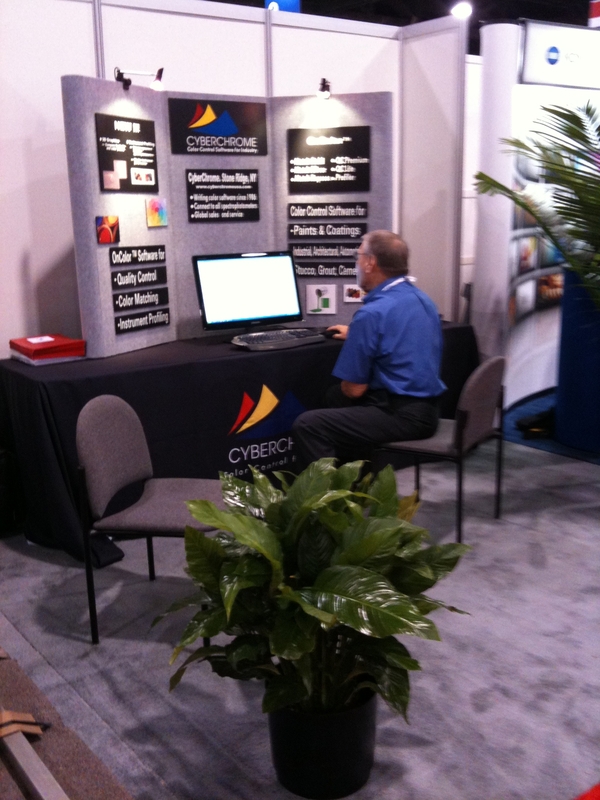 CyberChrome Inc was an exhibitor at the recent American Coatings Show in Charlotte, NC. Featured products included OnColor Profiler for improving inter-instrument agreement and the OnColor Suite of color management software for quality control and color formulation. According to the press release from the American Coatings Society, "With 328 exhibitors and about 6,700 overall participants (2008: 331 / 5,600), the second edition of the American Coatings Show & Conference was hugely successful as the highlight event of the US paint and coatings industry. The combination of trade show and conference, held April 12-15, 2010 at the Charlotte Convention Center, North Carolina, thus once again exceeded all expectations." Attendees came from not only North and South America, but there was a strong presence from Asia as well. Visitors at the CyberChrome booth included many US companies but also companies from Canada, Mexico, India, China, and other Pac Rim countries. Interest in instrument profiling was high as companies struggle to manufacture to the same electronic color standards with tight color tolerances around the world. OnColor Profiler helps to meet the objective by providing much tighter inter-instrument agreement and allows them to meet the rigid color tolerances demanded in today's market. Many larger companies are also interested in placing color matching systems at their distributor locations where they can match their own custom colors and reduce the burden on the color lab at the main facility. It also allows distributors to turn around custom matches in a much shorter time. CyberChrome's Match Express software provides an affordable and easy to use software package for distribution locations. While attendance was "decent" at this show, exhibitors and attendees both wonder about the future of trade shows such as this one. With internet meetings, webinars, and the high costs of travel, it seems like fewer and fewer people attend these shows. There is still much to be said for face to face meeting, ralationship building and the social interaction that happens at events like this. What are your thoughts on attending trade shows in the future?